Hi. We have a farm and in the next year or two we will need to replace our aging, large open-air barn. In addition to the tractors, skid steers, and other farm equipment I’ll be storing there, I’m obviously going to try to accommodate a 28’ Airstream trailer and 3/4 ton pickup, and this time the machine shed will be fully enclosed. I’ve seen photos of some pretty nice garages on this site. I’m wondering if any of you have worked with companies who specialize in the manufacturing and construction of these pole barn/post frame buildings and have any recommendations to share. I worked with an architect on a design for a large machine shed and woodworking shop design (over 10k square feet) and it was a nice architectural statement but the projected costs far outweigh the intended purpose. So I’m looking to go a little less “Gucci” on this round. I had a Gucci “barn” built to house our Airstream, pickup, exercise equipment, pool table, etc so I can’t help you on design. However, I do recommend having enough room around your pickup to be able to open doors on both sides as well as your tailgate when the barn doors are shut (I chose to put budget into the interior so didn’t give myself this luxury of space). It would be real nice in inclement weather. 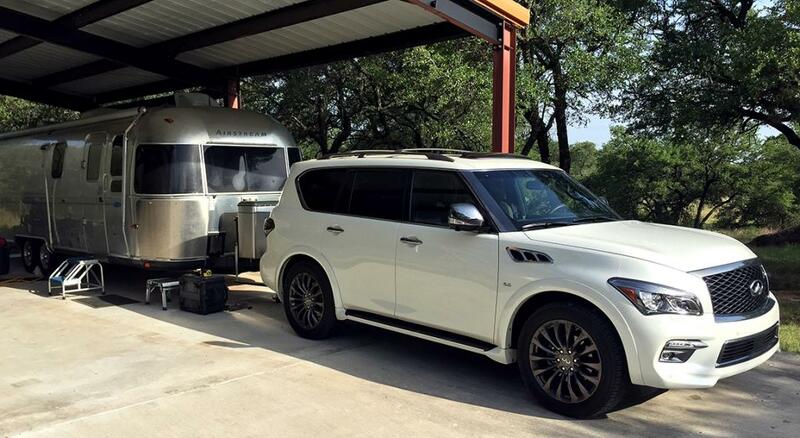 2’-3’ on each side of the Airstream seems to be all I need for walk-around space. Gonna be a fun project for you! Post pics when it’s completed! I have a pole building to store our “toys”. It was built by a local company that specializes in ag buildings. My recommendation is for you to talk to neighbors that may have used local companies to build ag buildings in your area. There are a couple of major (nationwide) builders out there, for me, they could not complete with the locals in price vs quality. there are ads for many firms that make small shelter and buildings in the back of Popular science and Popular mechanics etc. I had my "barn" built by Morton Buildings. They did an excellent job and I highly recommend them but I should have made my building bigger! I’ve seen photos of some pretty nice garages on this site. I second Morton Buildings. I had them build a barn for toy storage before we had an Airstream. We’ve moved now and want a similar building, but with a taller door this time. They did an outstanding job. We went the barndominium route, and love it. I built a 60' x 80' red iron building and lumber framed a living space over a 4 car garage. It left a 50'x 60' Airstream hanger. The building company we used told me 60' wide was the break-over point on width. Any wider and cost went up exponentially. 60' is deep enough to leave the TV and 27FC hitch and close the door. Full hook-ups are plumbed and the space is heated so no more winterizing! It has been the right thing for us. In Texas, as shown in our avatar, we have a 40x30 ft. pole barn from Mueller Metal Buildings. It is 12 ft. high on each side,a nd we paid a crew to bolt it together. Mueller reinforced it for our severe weather. Works well for one trailer and vehicles. Later our son purchased a similar sized trailer, and they store it in the pole barn. 30 ft. wide is too narrow to easily place vehicles between the trailers. Wish we had a 40 x 50. We are glad we invested in the concrete floor. Roof saves us from more Texas hail damage. I have 2 pole barns in Wis. and am going to have another built in western Illinois. Changes I am going to make are 1. for the Airstream a 12' opening on either end for a drive through convenience 2. Make it red and look like a barn so it's not so ugly. 3. A 200 amp service and 3. foam sprayed insulation at least on the inside of the roof with the foam that rodents can't eat through. I hate how noisy they are without the foam when it rains. We are across the country, but MQS in Stevensville, MT web site would be a good source for post & beam construction ideas ... We have a considerable snow load around here which dictates healthy design for wind and ice accumulation. The lean to addition on one side makes it versatile for the tractor, truck, and Eddie Bauer for all seasons. The sliding barn doors provide much better access and security over the roll ups... with less hassle in the winter and less drifting snow in the winter for the enclosed area. We too are building our RV home for the Airstream and welcome the comments regarding Morton Buildings. Our pick as well. Working on the plans now. Our 30 ft. Airstream will be right in the middle of the living room/party room, next to my Flamingo sculpture. Thanks for making me feel even better about our choice of builders.